Did you know that there is abundant scientific evidence in support of biblical creation? In this article, I (1) define scientific biblical creationism; (2) discuss what the Bible says about creation; (3) look at how the Bible determines the age of the earth; and (4) give scientific evidence confirming the biblical account of creation. Those who reject the biblical account of creation have no foundation on which to place their trust in Yeshua (Jesus). After all, if God didn't get the details of Genesis 1 right, then why should we believe He got the details right in the plan of salvation? Consequently, if you can't trust Genesis 1:1, then you have no logical reason to trust John 3:16. Since the Apostle Peter advises us to always have logical reasons for our faith, in this article, I will show that observable science confirms the biblical account of creation. But first, I will need to define a few terms. A biblical creationist relies only on the Bible to explain and defend belief in creation. A scientific creationist relies only on scientific evidence to support and explain special creation. A scientific biblical creationist relies fully on the Bible, but also uses scientific evidence to support and defend belief in creation. As a Bible-believing Christian, I accept that the Bible is the inspired Word of God, infallible in all its original manuscripts (2 Timothy 3:16). So let's first consider what the Bible has to say about creation. 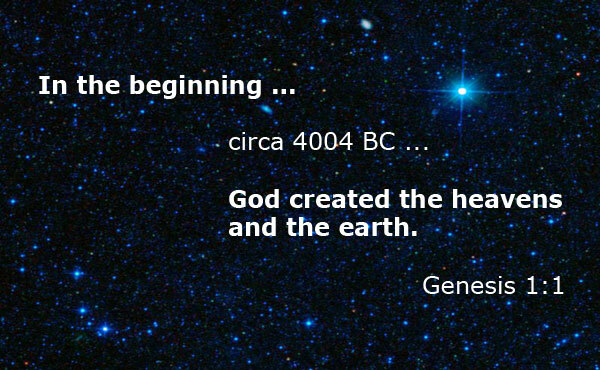 The first verse of the first chapter of the Bible clearly says that, “In the beginning God created the heavens and the earth” (Genesis 1:1). God is identified as the Creator. There is no mention of a big bang or of evolution. If God said, even once, that He is the Creator, then that should settle the issue. However, the Word of God does not name Him as the Creator just once, but many times. Let's look at some of the verses that equate God (the Father, Son, and Holy Spirit) with the Creator. You alone are the Lord, Creator of the heavens and all the stars, Creator of the earth and those who live on it, Creator of the ocean and all its creatures. You are the source of life, praised by the stars that fill the heavens. By his wisdom and knowledge the Lord created heaven and earth. But the Lord created the stars and put them in place. Jonah answered, "I'm a Hebrew, and I worship the Lord God of heaven, who made the sea and the dry land." ... The Lord spread out the heavens. He laid the foundation of the earth. He created the spirits of all men. Don't we all have one father? Hasn't one God created us? When the rest of the Lord's followers heard this, they prayed together and said: Master, you created heaven and earth, the sea, and everything in them. The scripture quotations above are taken from the books of the Bible highlighted below. Notice that the verses come from every major division of the Bible, both Old and New Testaments. The quotations I've given are only a small sampling of the verses that reference divine creation. In fact, there are references to creation in every book of the Bible! Let me begin by saying the Bible does not give a date of creation. Furthermore, there is no definitive method of calculating the date of creation with to-the-year accuracy. However, the Bible does give enough information for us to calculate a rough date of creation. Well-respected scholars, historians, theologians, and scientists have given estimates of the date of creation. The best-known creation date was calculated by Archbishop James Ussher. Using the chronologies in Genesis 5 and Genesis 11, together with other Bible passages, Ussher calculated the date of creation to 4004 B.C. Isaac Newton dated creation to about 4000 B.C. Johannes Kepler dated creation to 3977 B.C. From John Lightfoot we get the date 3960 B.C. Most other estimates range from 5555 to 3961 B.C. However, the Hebrew calendar has traditionally dated the creation to 3761 B.C. To many people, the idea of such a "young" earth seems utterly ridiculous. However, the concept of a young earth was widely accepted before the onset of Darwinism. Since then our society has been indoctrinated with evolutionary philosophy. The educational system, popular media, and society-at-large accepts the evolutionary old-earth worldview. It's all that many people know. It's all they've ever been taught and led to believe. However, there is abundant scientific evidence that the earth (and universe) is no more than 10,000 years old. Scientific creationism relies only on scientific evidence to support and explain special creation. There is an abundance of scientific evidence in support of creation. Let's begin by looking at scientific evidence in support of a young earth. Soft tissue has been found in fossilized dinosaur bone. In 2005, flexible blood vessels, red blood cells long with soft and stretchy ligaments were found in a supposedly 68 million-year-old Tyrannosaurus rex ("T.rex") bone. Since then, there have been more than 30 other discoveries of preserved soft tissue in dinosaur bones. In addition, proteins such as collagen and hemoglobin have been discovered as well as DNA. This would not be possible if dinosaurs died off millions of years ago as evolutionists claim. Polystrate fossils (usually trees) are fossils that cut through multiple rock layers. The name "polystrate" derives from poly (many) strata (layers). These geological layers were supposedly laid down over thousands, if not millions, of years. It is simply not possible for polystrate fossils to have been buried slowly over such a tremendously long period of time. The top part of the trees would have rotted away leaving no fossil evidence long before new sediment layers were laid down. These are only two of many scientific evidences in support of a young earth. The evidence supports creation, not evolution. Living things reproduce after their own kind. Dogs give birth to other dogs and cats give birth to other cats. Dogs and cats cannot make "dats." (LOL) Each kind of living thing has its own unique and diverse gene pool. Natural selection and breeding experiments can lead to great variability within a kind; consider for example the many breeds of dogs. However, natural selection and breeding experiments cannot produce a new kind of animal. The laws of heredity support Biblical creation. As for the scientific evidence in support of creation, I've hardly scratched the surface. The website Creation.com has thousands of articles and videos on creation science. The Institute for Creation Research has spent decades studying the science behind Genesis. They have produced books, magazines, DVD's, etc that clearly explain the science of creation. At Answers in Genesis, you will find a wealth of useful information. There is an abundance of resources available for anyone who wants to understand the science of creation. Creation Today has even developed a handy search engine called Search Creation. I believe the Bible. If God said it, I believe it, and that's good enough for me. But I also have logical, scientific evidence to support my beliefs. That's why I am a scientific Biblical creationist.